Found solitary or in groups on ground in duff in coniferous and hardwood forests. 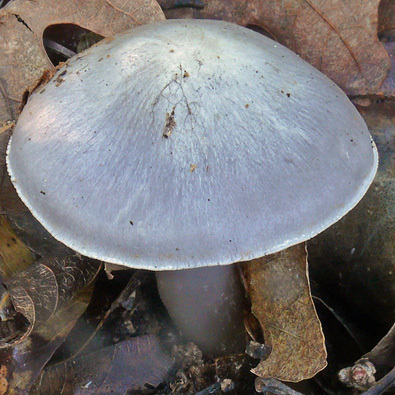 Cap: Pale violet, covered with silvery fibrils, dry, silky; convex to nearly flat in age with low, broad umbo; margin inrolled; flesh pale violet. 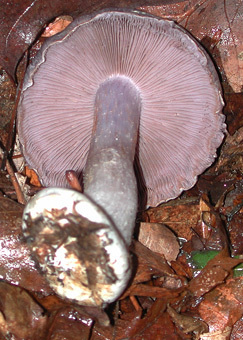 Gills: Pale violet becoming cinnamon-brown, close. Stalk: White to colored like cap, dry; when young sheathed from base to annular zone with a white silk veil which leaves a thin annular zone; tapers up (J. Solem, pers. comm. ).